Continuing the search for the best custard slice. And what I think I believe. Regular readers will remember this post on custard slices. And I’ve remained impressed enough by Greggs to keep my banner photo on Facebook: it’s a snap of their cake box. Until today. Today I managed to get to Jenkins Bakery in Station Road, Port Talbot, shortly after midday and there were still half a dozen custard slices left. And they were on special: 2 for £1.50. How can a girl resist? So, do they live up to my mother’s recommendations and my Aunty Marie’s yearning for a Jenkins custard slice when she takes a trip back from Hemel Hempstead to her home town of Llanelli (home of Jenkins Bakery)? I’m not sure. It’s difficult to remember tastes with any measure of precision. But I don’t think there's really any difference in the custard at Greggs and the custard at Jenkins. And, comparing the photos, Greggs has more of it. 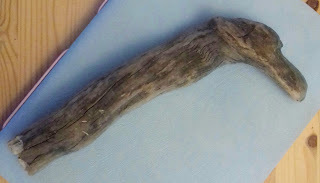 Where Jenkins does gain brownie points is in the pastry crust: it was still crisp (but thin and flaky) six hours later. The local elections in Port Talbot yesterday produced a landslide for the Labour Party. I don’t really understand it as the people I’ve spoken to are mainly disappointed and angry about how the Labour controlled local authority have managed the town’s developments over recent years. Turn-out was low though. Less than 35% in the ward my parents live in. Perhaps pro-Labour supporters are more politically motivated? 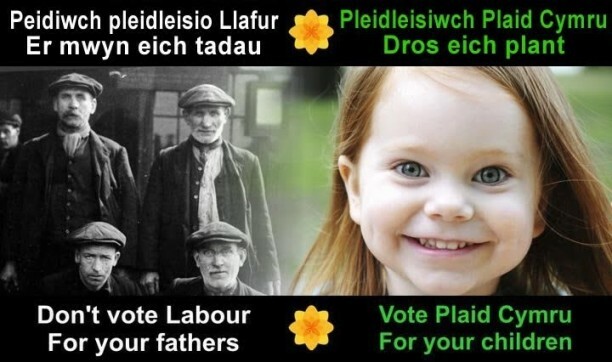 Plaid Cymru had an interesting poster as part of their election campaign. How many of us stick to things that are familiar to us rather than question what we believe, or what we think we believe, and re-evaluate our views and opinions? This is something I keep coming up against as I research for Real Port Talbot. I think I know something. I think I’m familiar with an area. But when I reflect and question, and when I really open my eyes and look at my environment, I realise I’ve been hoarding received ideas, ideas I’ve accepted from other people. And what I thought I knew about some things, some places, isn’t my experience or my reality. This is both revelatory and disturbing. Honesty, particularly self-honesty, is rarely comfortable. Write about searching for something. Write about the memory of a particular taste. Write about what you think you believe. Write about a time when you were honest. My son's Dycu loved a custard slice, though he probably remembered the Aberdare variety most fondly... I don't eat custard slices any more, but am warmed by the friendliness of Llanelli people every time I go there! I find the best custard slice has a wobble to the custard. Greg's is a bit too solid for my taste, almost like they make it separately and then place on pastry, rather than slathering the still warm but firm goo onto it. The squish of proper custard means they cannot be eaten with at least some of it landing on your chin or jumper. Eynon's were the best for me, after my mother's of course. I use confectioner's custard in mine with extra vanilla. Yum. As for the politics of NPT, I think there is an awful lot of voter apathy, which I loathe and while people want change, they aren't too sure if they have the power to change things (which of course voting gives them) and cannot think of what that change would be. I also think we (general) look back on the past with fondness and wish things were more like that. I do think the lack of the beach being more fun, the way people are more insular contributes. I remember our neighbours sittting chatting with cuppa's as we kids rushed around our close and us going down the beach all day, every day with our parents. Sadly, far too many jaunts for children involves pub's or the dreaded shopping. It is a shame. The Aberdare Custard Slice, eh? Hmmm... it seems I'll have to cast my net further, Judith.